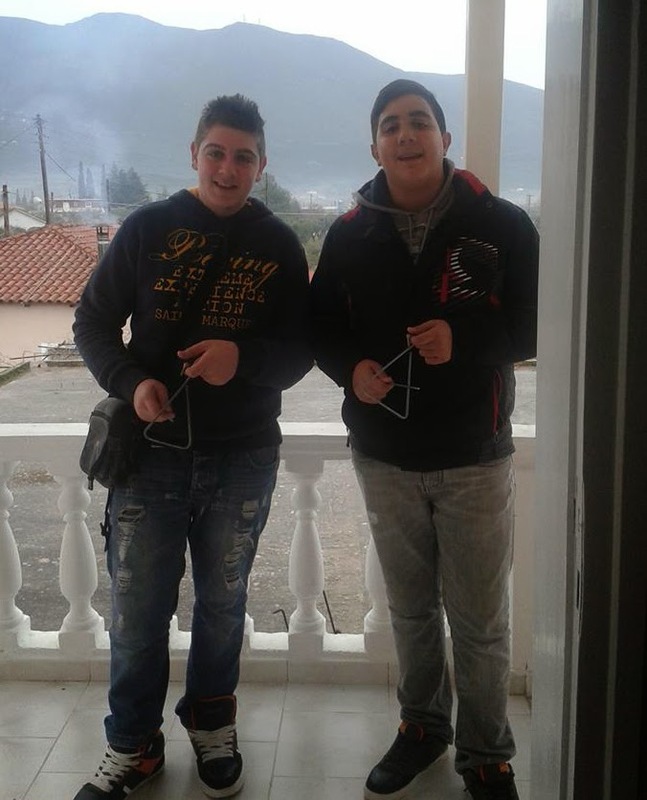 Christmas is a special celebration in Zakynthos and a good opportunity for everyone to spend more time with his family. Like in most places in the world, we have also many traditions that have passed to us from the previous generations and we all try to keep them alive as they are very important and vital for our culture. Christmas for us has always been more important than New Year’s Day. Children used to visit all the houses in their neighborhood playing Christmas triangles and singing Christmas carols. 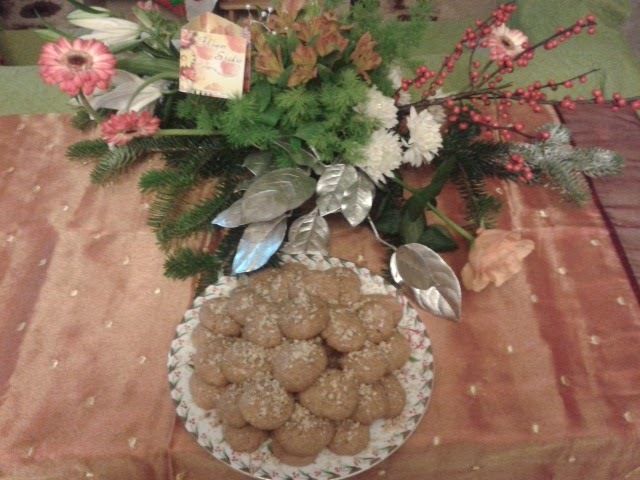 The resident of every house would then treat them raisins, nuts or Christmas sweets such as melomakarona (sweets made basically from honey, olive oil, cinnamon) and kourabiedes (biscuit-like sweets covered with sugar). In the old days the decoration of most houses was simple and many people used a branch from a tree and some Christmas balls that they had made on their own. 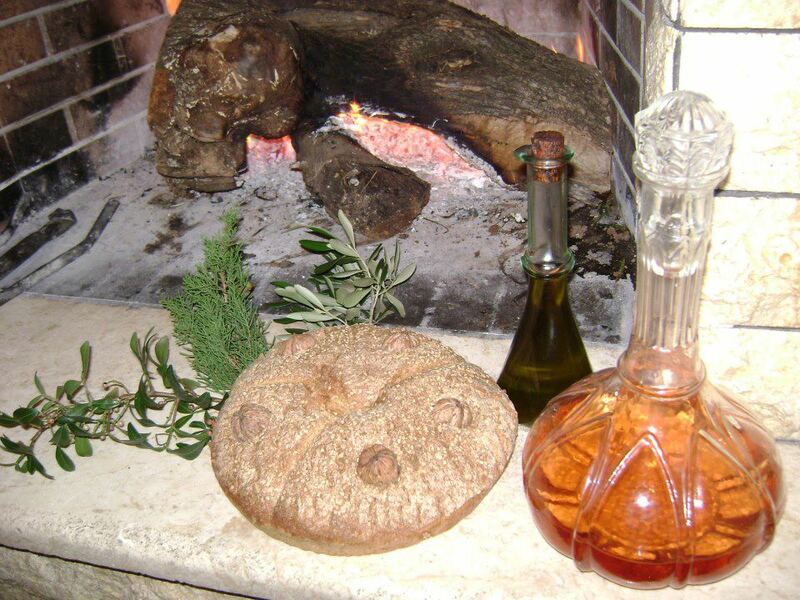 Kouloura, Wine and Olive Oil. 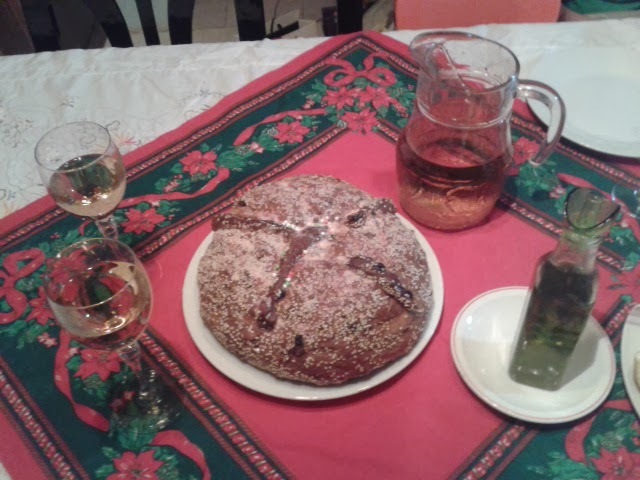 The traditional food we eat at Christmas Eve is broccoli boiled in water and of course the kouloura. Kouloura is a type of bread with sweet taste and some of its main ingredients are anise, cinnamon, carnation and some decorative sweets on the top of it. It may also contain raisins and nuts. The dinner starts with the broccoli and then we cut the kouloura in as many pieces as the members of the family are, whether they are present or not. The first piece though is for Jesus Christ and the second one for the house. Inside the kouloura there is a coin and whoever gets the piece that has the coin inside, is considered to be lucky for the whole next year. The oldest man of the family, before he cuts the kouloura in pieces, he forms a cross three times on top of it by pouring olive oil and wine. At the same time he is saying “God blessed us with bread, wine and oil”. After cutting the kouloura and everyone gets his piece, someone usually fires some gunshots outside as a way to share and let the others know about the happy event that has just taken place in his house. On Christmas day after having been to the church of their village the previous night, women start making the egg and lemon soup. They start by making a soup with any type or types of meet they prefer, like turkey, chicken or pork, and rice. Just when every member of the family arrives and everything is ready for the soup to be served, they add eggs mixed with lemon juice. 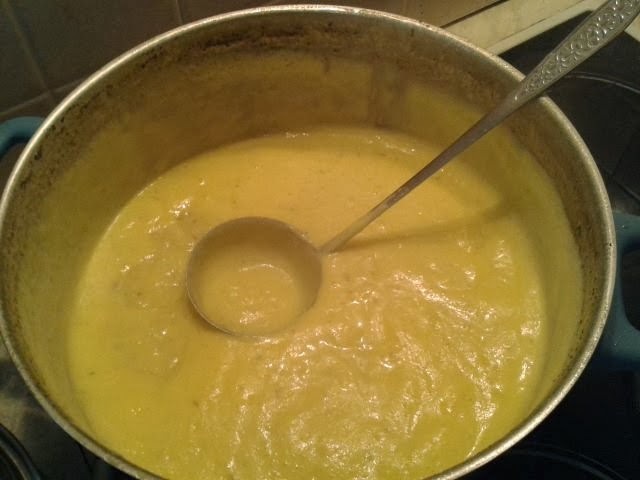 This makes the soup thick and gives it a nice yellow color and a unique taste which is usually combined with ladotiri ( Zakynthian local cheese made with olive oil). The egg and lemon soup is one of the most recognizable and favorite foods in Zakynthos and almost everyone is looking forward to enjoy it on Christmas Day. Many families make the egg and lemon soup more times during the winter when they have a celebration, some important guests or just because they like it very much. If you are ever invited into a Zakynthian house and have the opportunity to try this soup, you should definitely give it a try. New Year's Eve and "Podariko"
New Year’s day isn’t so important for us like Christmas is in terms of culture and tradition. It is more important for children since after having sung jingle bells to their neighbours and family, they get ready to make the “podariko“. “Podariko” comes from the Greek word “podi” which means foot, and it is actually the first person that enters the house after the year has changed. The first person that the residents of the house will see and say good morning. The person that does the “podariko” is very important and must be someone, usually a child because of its innocence, that is considered lucky and everyone in the family loves and likes. The family rewards the person that does the “podariko” usually with money. The belief of many Zakynthians is so strong, and was even stronger in the old days, that sometimes they don’t even get out of their house until the chosen person that will do the “podariko” arrives, in fear of meeting or seeing someone they don’t like or they think will bring them bad luck.